There’s something alchemical about extracting precious gold using deadly mercury and cyanide. But for the many who work in artisanal and small-scale mining (ASM), this bit of alchemy is a grim reality that often results in mercury or cyanide poisoning, death, and environmental degradation. Worldwide, some 15 million artisanal or small miners mine for gold using mercury or cyanide. In the Philippines, which is one of the most mineral-rich countries especially in gold, nickel, copper and chromite, some 300,000 gold miners rely on ASM as their main source of income, producing around 80% of the country’s gold supply. They earn somewhere between P300 to P1500 a day, but they pay for this with their lives, mining under unsafe conditions and using mercury via mercury amalgamation and cyanide via gold cyanidation to extract and purify gold from the ore. This problem called for an engineering, not alchemical, solution. Enter CLINN-GEM, which is short for the Community-Led Integrated Non-Mercury Non-Cyanide Gold Extraction Method. 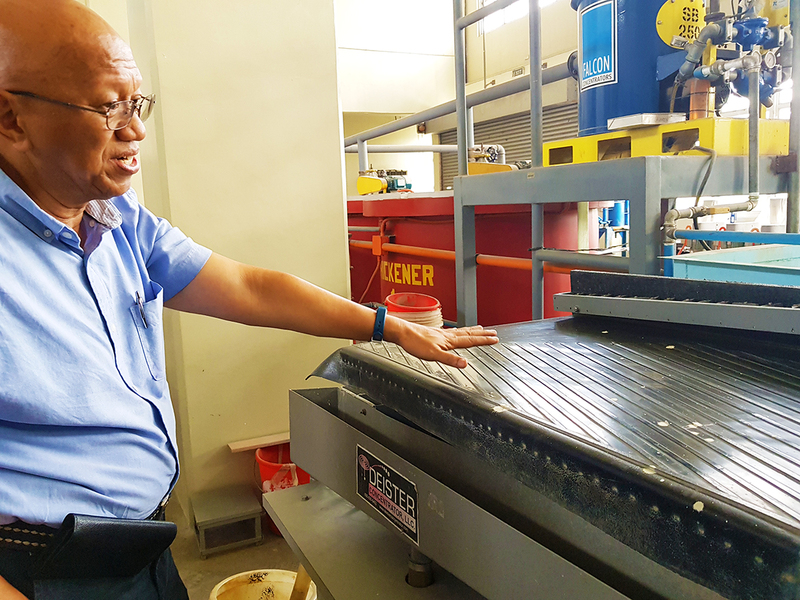 CLINN-GEM is the brainchild of its project leader, Dr. Herman D. Mendoza of the UP College of Engineering’s Department of Mining, Metallurgical and Materials Engineering (DMMME), who worked on it from 2008 to 2012. 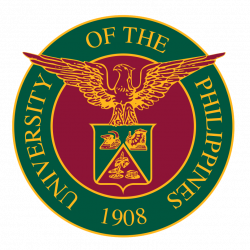 At the time, the Department of Science and Technology (DOST), under its Engineering Research and Development for Technology (ERDT) program, had been spurring research under its environment and infrastructure R&D track, which included the Better Mine program. “Better Mine is meant to make the mining and mineral industry better, but we were interested in small-scale mining. We knew there were serious problems in ASM,” Dr. Mendoza recalls. Their top priority was taking mercury and cyanide out of the entire extraction process. So Dr. Mendoza and his teams began developing technological alternatives to amalgamation and cyanidation for extracting gold as well as copper. They hit on the idea of using gravity to separate the gold from the ore by taking advantage of gold’s specific gravity and the way it behaves when placed in water. But for gold that has become as fine as dust and exponentially harder for small-scale miners to recover, Dr. Mendoza and his teams added a spin, so to speak. They used centrifugal force to enhance the separation of very fine gold particles and recover gold form the non-gold particles. This process is called enhanced gravity concentration, and work well in collecting both free coarse gold and very fine gold particles. But collecting the free gold is relatively easy, and many small-scale miners have had to settle for collecting only the gold nuggets and dust and discarding the rest as irrecoverable. However, gold comes in another form—as associated gold, or gold mixed in with or embedded into other minerals. 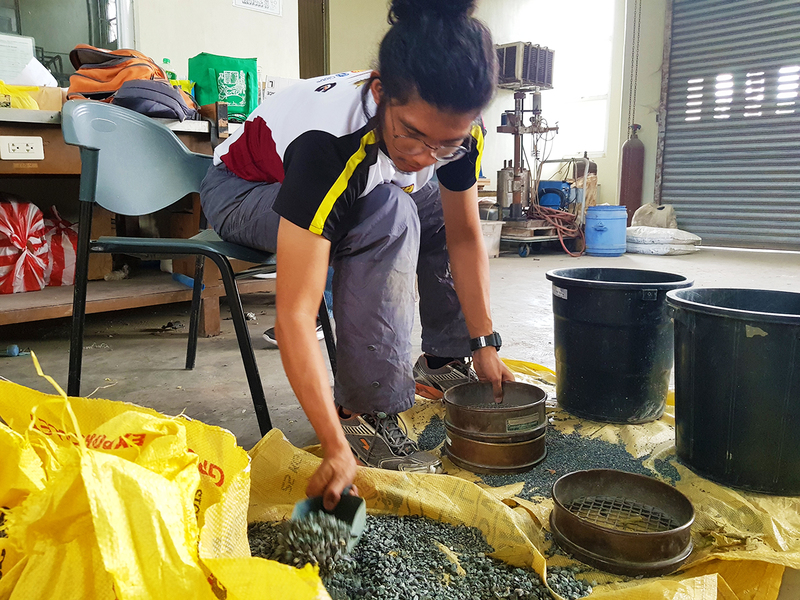 To extract this gold without resorting to amalgamation and cyanidation, Dr. Mendoza and his team collected ore samples from various parts of the country, studied their characteristics, and came up with a practical extraction process: flotation and leaching. The first step is flotation, which produces a concentrate consisting of gold associated with extraneous material and waste. The concentrate then goes through a leaching stage, which transforms the waste matrix into a leachable form in order to dissolve the gold easily, resulting in a loaded solution with gold ions, commonly called a pregnant solution. The solution with the dissolved gold then undergoes precipitation, with Dr. Mendoza and his team adding a “precipitant” to fully separate or leach the gold from the copper and remaining minerals. The precipitated gold sinks to the bottom of the solution, ready to be collected and refined. The recovery of gold from the ore is maximized, resulting in more profit for the small-miners. Extracting more gold more efficiently is only one half of what CLINN-GEM can do. The other half is dealing with one of the worst issues regarding the mining industry: tailings and waste. Dr. Mendoza points out that of every batch of ore dug out, only 0.1% of it is actually extracted and collected as valuable while the remaining 99.9% is discarded as waste. These waste materials are usually composed of fine particles, and when combined with the marine environment, they can wreak havoc upon the entire ecology. This is true for all kinds of mining, whether ASMs or large-scale. 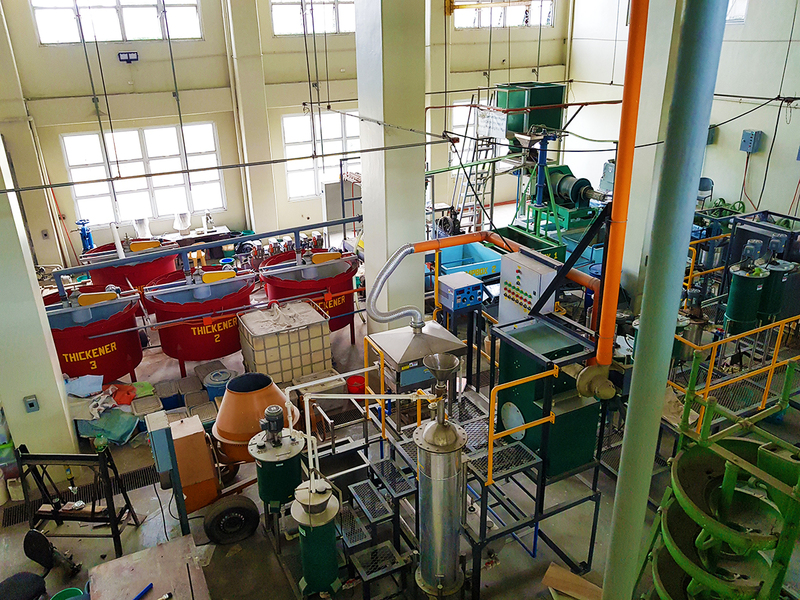 But CLINN-GEM has a way of treating the waste materials produced by mineral processing in a way that does minimal impact upon the environment. The waste produced by the enhanced gravitation concentration process consists of associated gold, and is put through the flotation and leaching processes to further squeeze the gold out of it. The waste produced by the flotation process is placed into settling ponds to separate the fine solids from the bulk liquid. Since CLINN-GEM uses no toxic or harmful chemicals, both liquid and solid waste from flotation are considered inert, or chemically unreactive and stable in the atmosphere. The liquids can be safely returned to the rivers, while the solids are packed into sacks and delivered to landfills or used in other ways, such as construction materials. Treating the waste from the leaching process is a bit more complicated, as the waste liquids contain heavy metals. CLINN-GEM also has a way to treat this, however, using both natural minerals and organic materials as absorbents to safely clear the heavy metals from the waste. “So there is a friendly extraction process to extract the gold from the concentrate, and there is a waste treatment part to address all the waste coming out of the plant,” Dr. Mendoza sums up. All of this—from extraction to waste treatment—are contained in just one CLINN-GEM plant or facility. Dr. Mendoza’s CLINN-GEM is designed for Filipino ASMs, using a range of collectors tailor-made for the specific mineral composition of the ore, which varies from area to area, and is built at a scale that makes it ideal for small mining communities in far-flung areas. It’s considerably safer for humans and more environment-friendly, making it the more sustainable option. Moreover, field-testing data has shown that gold (and copper) recovery rate, cost and processing time for CLINN-GEM are better, compared to existing ASM practices. So the technology is sound. 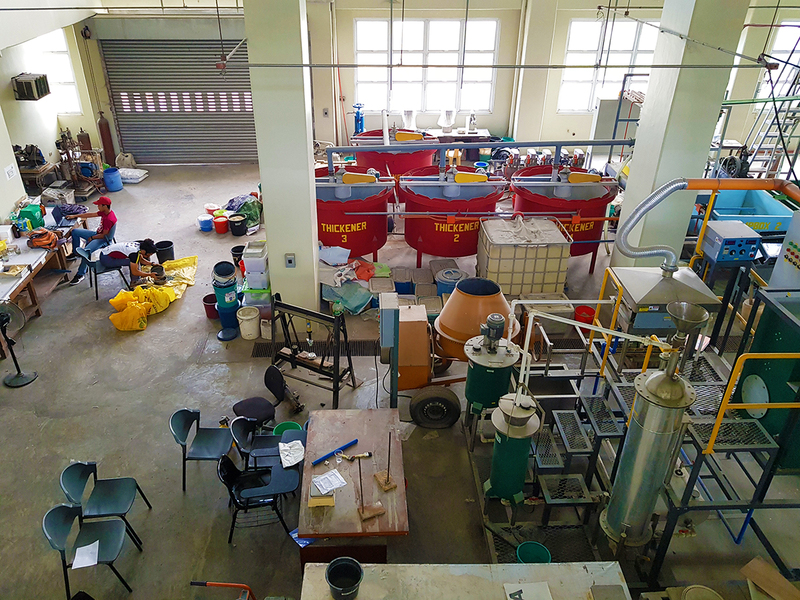 So sound that of the four different locations where CLINN-GEM is undergoing field testing—Benguet, Camarines Norte, Compostela Valley, and the CARAGA Region—one of them, in Itogon, Benguet, already has an operational facility capable of processing up to 10 metric tons of ore per batch. Because, if there is one thing he learned in the ten years he has spent working on the CLINN-GEM project, engineering and technology make up only one half of the alchemical equation for the transformation of lives. And this might just be the simpler half. Learn how the CLINN-GEM project was taken out of UP’s laboratory and brought into the communities and day-to-day lives of the country’s artisanal and small-scale miners in A better kind of alchemy (Part 2).